With little fanfare Mission’s Technical Centre of Excellence has opened its doors. Because this initiative holds such importance to the growing economy of Mission, the purpose of this article, under the direction of the Economic Development office and EDO Stacey Crawford, is to present the true facts about the Centre and clear up any lingering misunderstanding. Who is behind the Technical Centre of Excellence (TCE)? Answer: Mission’s TCE is the brainchild of the Sumas Regional Consortium for High Tech (SRCTec), and its founder, Raymond Szabada. The Sumas Regional Council for High Tech (SRCTec) is a not-for-profit organization governed by a select group of technology executives that form a volunteer board of directors. SRCTec is a coalition of local government, industry partners and high education institutions interested in attracting tech based investment into the “Region” (including the District of Mission, City of Abbotsford and Chilliwack). As a council, SRCTec understands the necessary infrastructure and programs required within the Region, that will attract tech based investment, create tech jobs, foster innovation and drive skilled training. Their objective is to: Build companies. Create Jobs and Invest in the Region’s Future. What does Mission’s TCE actually do? Skilled tech training and education. In order to deliver this program, as well as help to pay for the facility operations, two well established high tech businesses are also moving into the building in April 2015. These companies are bringing more than 30 well paying jobs to our downtown. Mission’s TCE is one of a number of early initiatives designed to create a technology hub in this region, and create high paying jobs for our residents who are now forced to commute into Vancouver to take advantage of such programs and resources. If this is a regional initiative, why is the TCE in Mission? Answer: Simply a fortunate set of circumstances. 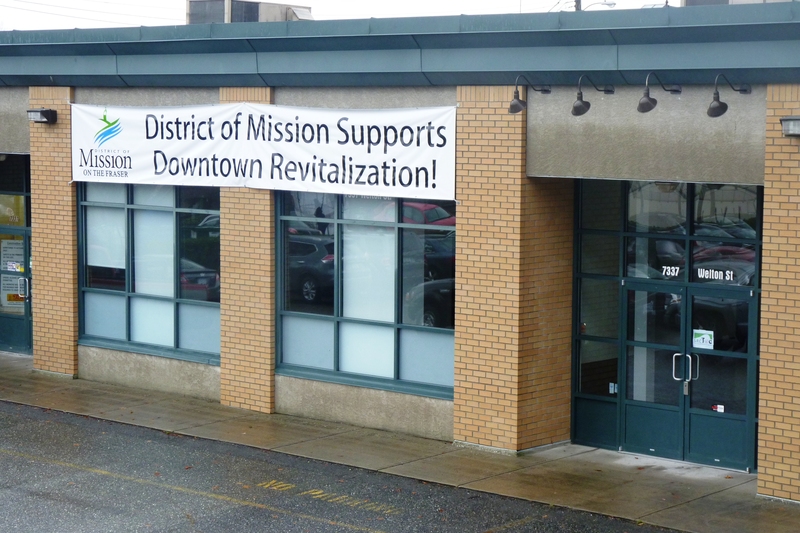 After many years of regional effort, Mission Council, with extensive public input, developed and acted upon a Downtown Revitalization Plan that included the purchase of a then vacant building. One of the major objectives of the Plan is to encourage investment to make the Downtown an attractive place to both live and work. Because the TCE will bring jobs and investment to Mission, it was viewed as a perfect fit to occupy the Welton Street property. In summary, the TCE could have been located anywhere in the Fraser Valley, because SRCTec has a regional mandate not specific to any one community. Mission had the building, the vision and the political will to make it happen. But I’ve heard that we are giving huge subsidies to private businesses to make it happen, and that’s not right. Why are we doing that? On the other hand, a manufacturing job supports fewer than two spin off jobs. (Source: Enrico Moretti –The New Geography of Jobs). So as Mission and the region gain credibility as what Dr. Evered calls “a brain hub”, or a high tech centre, the return to the municipality in terms of economic growth, jobs and tax dollars will be significant. That’s what economic development initiatives are all about. In fact, these efforts are the result of a technology sector development plan adopted by Council in 2011 and build on the $500,000 municipal investment into UFV’s Graphic & Digital Design Diploma Program and the creation of the Information Technology Technician Certificate training at Riverside College. These are all key long-term investments in fundamental educational infrastructure that supports sector development and job creation for our community. The Welton Street building is a lot bigger than that. What are the plans for the rest of it? Answer: The entire building is about 11,000 ft2. 2,300 ft2 have been leased to established high tech companies at market rates. 3,000 ft2 has been leased to SRCTec for the TCE. And in January, Mission’s economic development office will re-locate from the Chamber of Commerce to this strategic and highly visible location. There is a plan to lease the west side of the building to a very compatible development friendly organization, but those talks are confidential at the moment. This will leave approximately 2,000 ft2 that will likely be held in reserve for tech friendly expansion. Who are the companies coming in? I’ve heard they have no substance? Answer: The main company is i-Open Technologies Inc. i-Open is a team of 26 workers and management engaged in providing business solutions to both domestic and international clients. The company has grown over 300% in the last 2 fiscal years, and aspires to rapidly expand its international business. i-Open currently occupies offices in Abbotsford at 30701 Simpson Road, but has negotiated to pay out their lease at the end of March 2015 in order to move to Mission. And why Mission? Two main reasons. First, the company wants to bring its business close to the TCE so start up enterprises can benefit from its experience. Second, no fewer than four of the last seven people hired by i-Open are Mission residents, so it makes sense for the company to locate close to a major source of employees. The second company is WiseBox Solutions Inc. WiseBox is now a fully incorporated start-up with a team of five, developing state of the art applications pertaining to online electronic medical records and management of health care clinics. In fact, WiseBox could be considered as the TCE’s first client. The first of many, as soon as the promised funding is in place. That is because more than 20 businesses have already expressed interest in the intake process of the Agriculture innovation program (as mentioned above). Many more will participate as part of the network and related training programs and workshops. tagged with 7337 Welton Streeet, business in Mission, economic development, I-Open Technologies Inc., innovation, Mission BC, Mission Businesses, SRCtec, Tech Hub, Tech starts here, Technology, Welton Common, WiseBox Solutions Inc.